The Signals is ThermoWorks’ 4-channel WiFi/Bluetooth Thermometer combo, and it’s one of the best we’ve ever used. 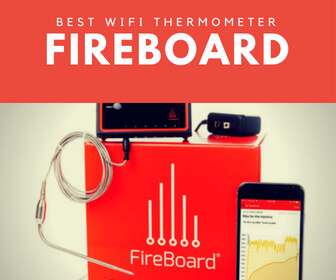 Here’s our take and why it sits in our #1 spot as the best WiFi thermometer. Whether you’re a professional BBQ competitor or just an enthusiastic backyard BBQ aficionado, the ThermoWorks Signals deserves a spot in your smoking tool lineup. It’s a commercial-grade smart thermometer with 4 probe channels, comes with 4 probes, connects to your phone via both WiFi and Bluetooth, and is built like a veritable tank, with a splashproof, IP66-rated casing. Props to ThermoWorks for sending the Signals out so quickly. It arrived – neatly packaged – on our front doorstep the day after ordering. That’s faster than Amazon Prime, for those keeping score – they even threw in a pack of Jelly Beans. Okay, on with our review and unboxing. We’ll be putting all those to the test numbers to the test to see if they can achieve what they say they can. Our first impression of this thing is that it’s tough – and very compact. Build construction and quality are superb. It’s a very strong, durable plastic (likely polycarbonate) and it inspires confidence – something we’re always looking for in our devices. ThermoWorks says it is IP66-rated. That means it’s splashproof, as well as entirely dustproof and particle-resistant. 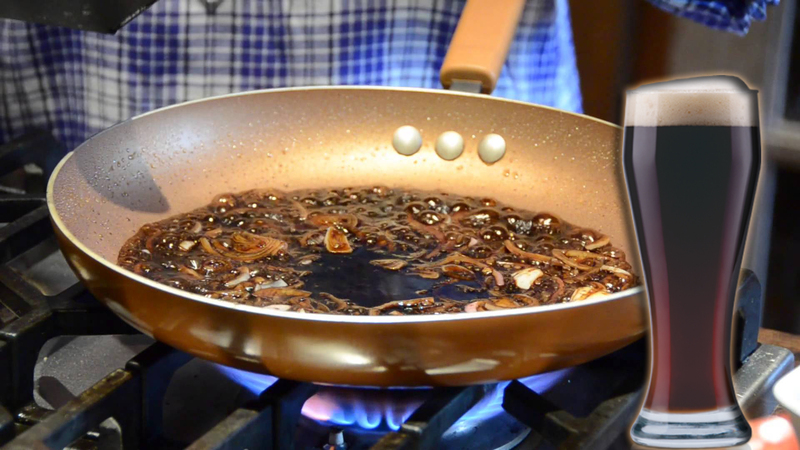 We don’t doubt it and have no fear of it getting a bit wet while cooking – whether from water or flying, hot grease. While it’s not protected against full immersion, we didn’t have any problems running it quickly under the tap. ThermoWorks makes no mention of impact-resistance, but it felt durable enough that we got adventurous and dropped it off the counter onto the deck. It keeps performing like a champ and without a scratch. So it can handle a couple tumbles. Friendly Disclaimer: We don’t suggest subjecting your Signals to intentional abuse tests like this. It’s not worth pushing your luck and breaking a device this nice. And while ThermoWorks does include a 2-Year Warranty, that warranty doesn’t include damage willfully inflicted because you saw some geeks on the internet do it. Once we acclimated to just how solid this thing is, we noticed how good the overall design and interface is. The flat bottom has a rubberized grip that allows it to sit sturdily on the grill or countertop, and the front is gently angled to make it easy to quickly glance at the LCD screen. This angled design also make it easier to access the six frontal buttons, which control navigation, select between channels, set alarms, adjust volume, and adjust brightness. The power button is located on the back. On the side are the 4 probe ports and a USB-C charging port. 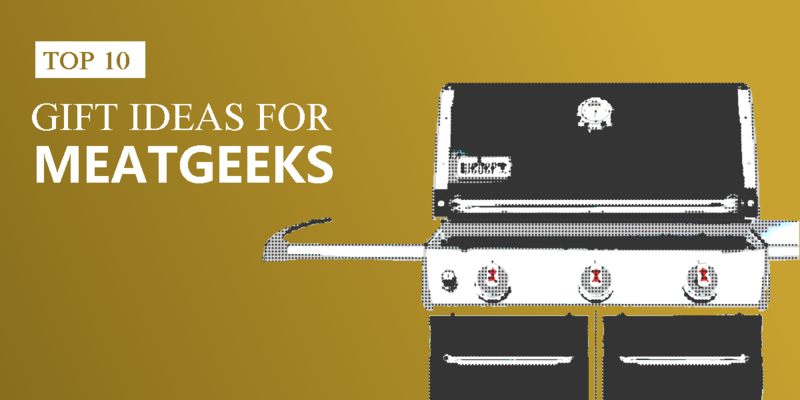 As far as we know, the Signals is the only smart meat thermometer that employs USB-C (more on this later). On the back you’ll find two magnets for securing the device to the grill (or stove or oven). These magnets are fairly strong, too; he device firmly latches on to the side of the grill with a snap, and stays there until you make a real effort to pull it off. Navigating the device is easy and straightforward. The LCD screen itself is simple, showing WiFi and battery, and each of the 4 probe channels in their own corner. 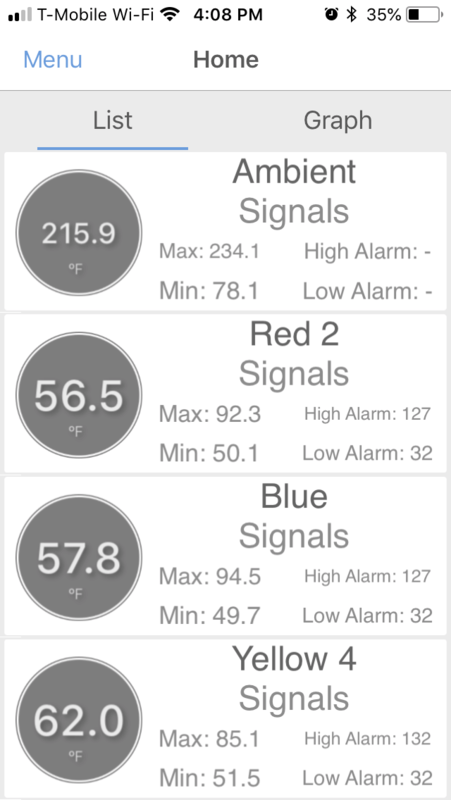 Each probe channel displays its own Max Temp, Min Temp, Alarm On/Off, and Current Temperature. The current temp reading is big and bold – unlike a few other displays we’ve used – and it’s a breeze to glance at from a distance. The screen is also comfortably large, for that matter. We love how everything you need to see is displayed front and center, as well as constantly during use. It has a nice backlight, which can be toggled on and off using the lightbulb button on the front and via the power button on the back. One great option that we’re glad the Signals includes is toggling alarm volume with a dedicated button on the front. You can set alarms to one of 4 volume levels or mute them, but even when muted, it will still beep when any of the buttons are pressed. We’re not sure why ThermoWorks didn’t mute those too – but we really wish they had, if just for the sake of scaring the dog less. 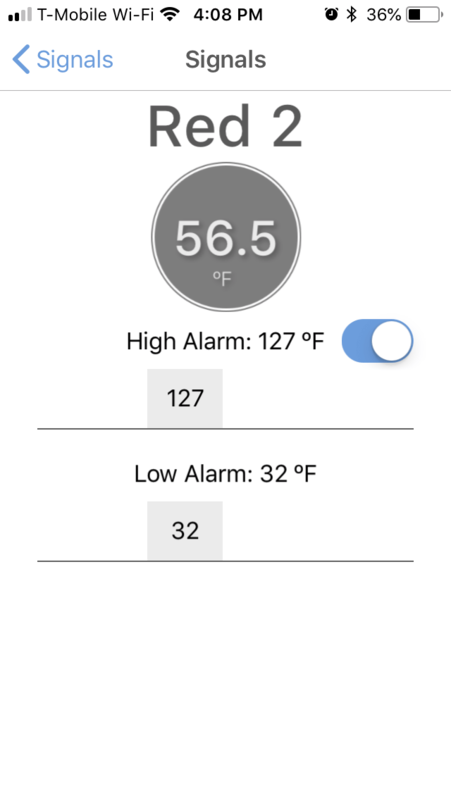 One of the best things about the Signals – and something that few other smart thermometers can do – is connect to both Bluetooth and WiFi. That’s twice the fun in one device! WiFi connectivity is great when you want to leave the house, run errands or just relax away from the grill during a marathon smoking session. Bluetooth is handy when you don’t have WiFi available – such as when you’re grilling out at the campsite or the tailgate. Or maybe you just want the easiest, plug-and-play connectivity possible. To connect the Signals with the ThermoWorks App on your phone, first connect the two via Bluetooth. 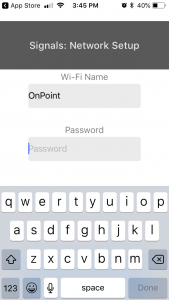 Then, enter your WiFi network and password – and you’re off. The whole process takes under a minute and is far simpler than it is on most WiFi thermometers. Many have a tendency for clunky, complicated setup. The Maximum Bluetooth range on the Signals is about 95 feet, but can be less due to obstacles like walls. Walking around the house and the backyard, we stayed connected for roughly 100 feet or so. With WiFi, your range is practically unlimited thanks to cloud connectivity. ThermoWorks is the best in the business when it comes to temperature probes. With the Signals, they have included their Pro-Series thermistor probes. There’s 3 meat probes and 1 ambient probe, which – unlike the meat probes – is straight and not pointed. ThermoWorks also includes a metal clip for situating the ambient probe on the pit grates. Technically, thermistors are slower and less accurate than their pricier Thermocouple cousins, but we haven’t noticed any difference when actually smoking food. These Pro-Series probes have as much range as most Thermocouples, (up to 572F) and are accurate to within 1.8F. Even the best Thermocouples are only only reliable to about .7F. When actually cooking, these read plenty fast enough and aren’t discernibly slower than any other probe we’ve ever used. When tested in both boiling water and ice, they were right on target. When choosing between various thermometers and probes, remember that thermocouples are not necessarily better than thermistors. Yes, they are more sensitive and faster – but only slightly. And you don’t need that speed and accuracy for slow-cooking. If the probe is firmly planted in the middle of the roast, the temperature rises slowly enough that the extra second or even fractions of a second more the thermistor takes, don’t even matter. The cables are just under 4 feet long, a length we find comfortable while also still manageable. But a word of warning: while the metal probes themselves can handle some very high temperatures, the plastic connectors where the probes meet the cables aren’t as resistant. ThermoWorks rates the connectors safe up to 700°F; we melted two connectors right around 700°F after 2 minutes. 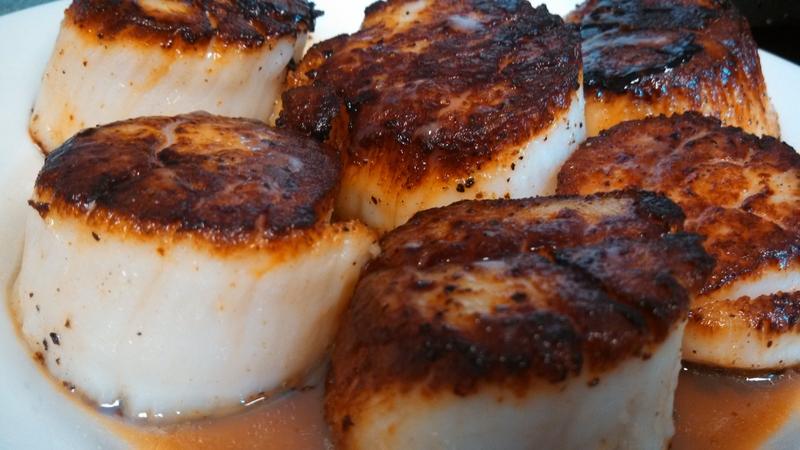 So, you don’t want to leave the probes in when searing, just in case dripping fat causes the coals to flare up and spike heat to 600°F+. 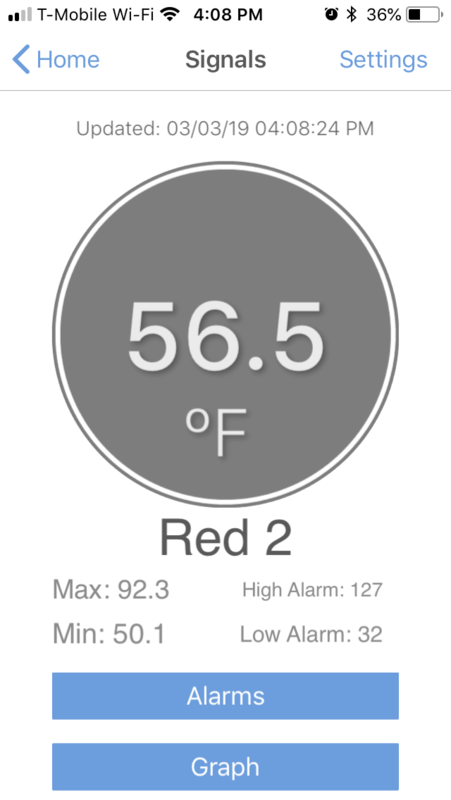 The Signals connects to the standard ThermoWorks app, which is free to download. 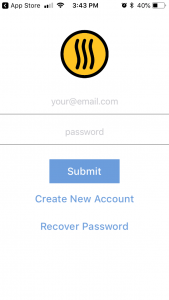 If you’ve used it for any of their other devices, you know how straightforward and easy-to-use it is. Probe temperatures are displayed nice and big up front-and-center. 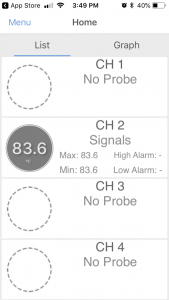 You can easily set alarms and alerts and customize the probe names. And cooking graphs are quick to access and export. ThermoWorks even lets you customize the temperature refresh rate, choosing between 10, 20, 30 or 60-second intervals. We love this, and it’s something most WiFi thermometers are sorely lacking, stuck at 1-minute intervals or needing to be manually refreshed in the app. 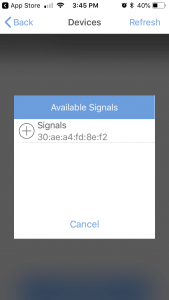 Signals is on top of things and even tells you when it last refreshed down to the second. Feel like switching between WiFi and Bluetooth during a single session? No problem. 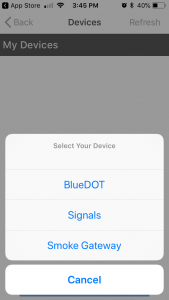 Just toggle your phone’s Bluetooth or WiFi on or off, and Signals automatically switches over to the other without a hitch. 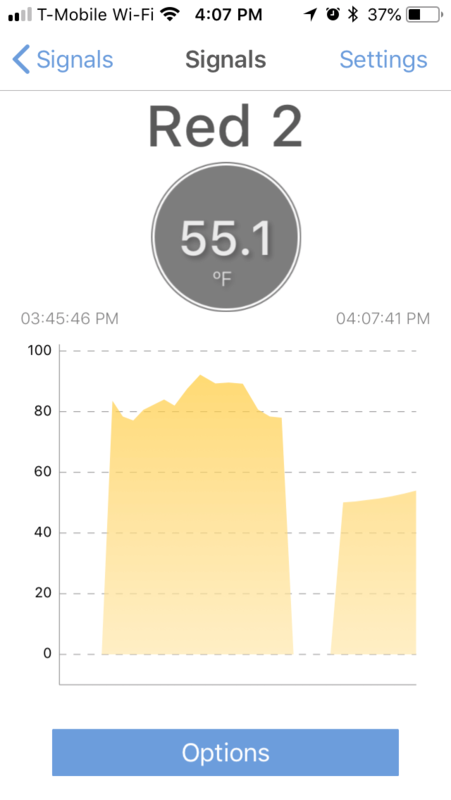 The app can store up to your 10 latest cooks on the cloud, with graphs, mix/max history and alert history accessible anytime. You can also download them straight to your phone. Our only complaint about the app is the lack of note taking for each session right in the app, like you can do with the Fireboard. 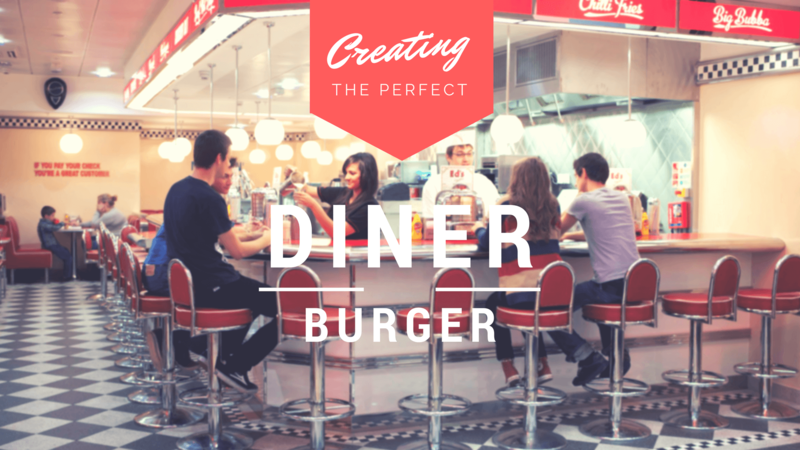 We’d love the ability to hammer out some quick notes about the cook and to save and export along with the chart. As mentioned, the Signals gives you the choice to customize both High and Low Temperature Alarms for each probe. There are no fancy presets for meats, like other thermometers, but typing in the desired number is super quick and easy. And when your food is done – you’ll know it: the alarms are VERY loud at max volume (90dB), and we could hear them from inside the house – with the door closed! The app will vibrate and beep on your phone too – just not as loudly. ThermoWorks claims Signals has 16-hour battery life with probes in and monitoring actively. We used it on a 6-hour smoke, before leaving it on overnight to see how if it could hold up to the claim. By morning, roughly 18 hours later, it was drained. For charging, the Signals uses a USB-C cable. That’s noteworthy. As far as we know, this is the only smart thermometer to use this latest-and-greatest connector. USB-C can deliver far more power than a regular USB port – in this case, 12V vs 5V – so the battery charges exponentially faster. Somehow, it still takes about 12 hours to fully charge –a bit lengthy. You have the option of charging on the wall with the included AC adapter or plugging it into your computer. 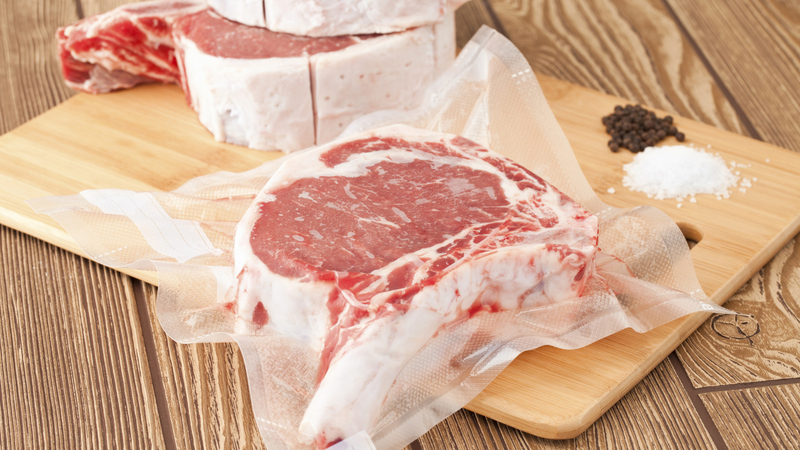 Using the Signals to smoke a piece of meat, monitor the turkey in the oven, or even just grill up some steaks, is about as easy a process as can be. 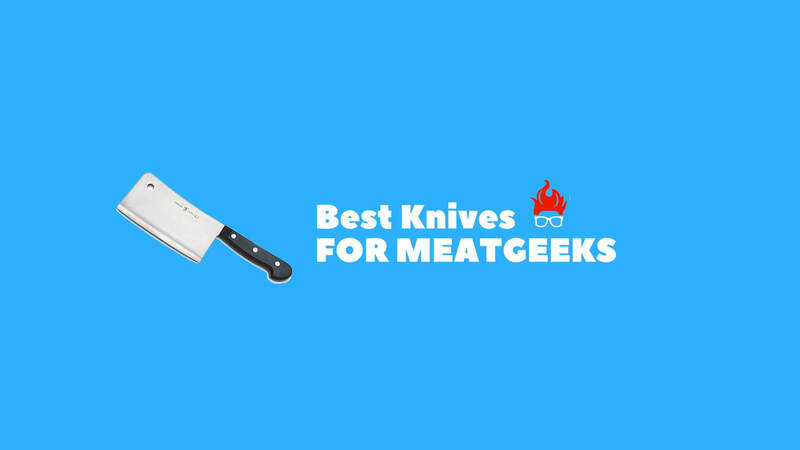 You can set it up for the first time, learn to use and navigate it, and have it out there monitoring meat and smoker temperatures in less than 5 minutes. Easily. We felt confident leaving our barbecue under its watchful eye as we went about our day, and it safely, effectively alerted us when the food was done. Many WiFi thermometers are just too clunky to setup and unintuitive to use. The same goes for many of their respective apps. But ThermoWorks nailed it with the Signals, combining efficient design, straightforward function, accurate probes, and ease-of-use into one sturdy device. (What else would you expect from the makers of the best instant read thermometer?) It’s pricey, but cheaper than some subpar competitors, and worth every penny. 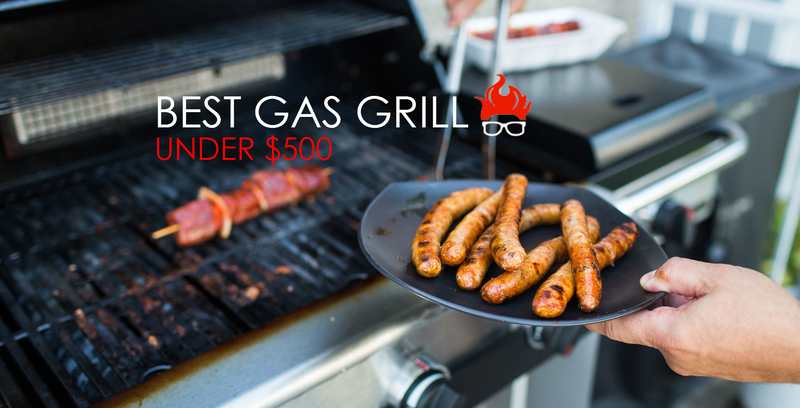 When we reach for a meat thermometer during our next barbecue, you can bet we’ll reach for this bad boy. 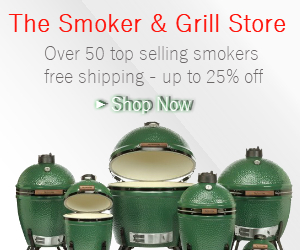 Should you buy a smoker? 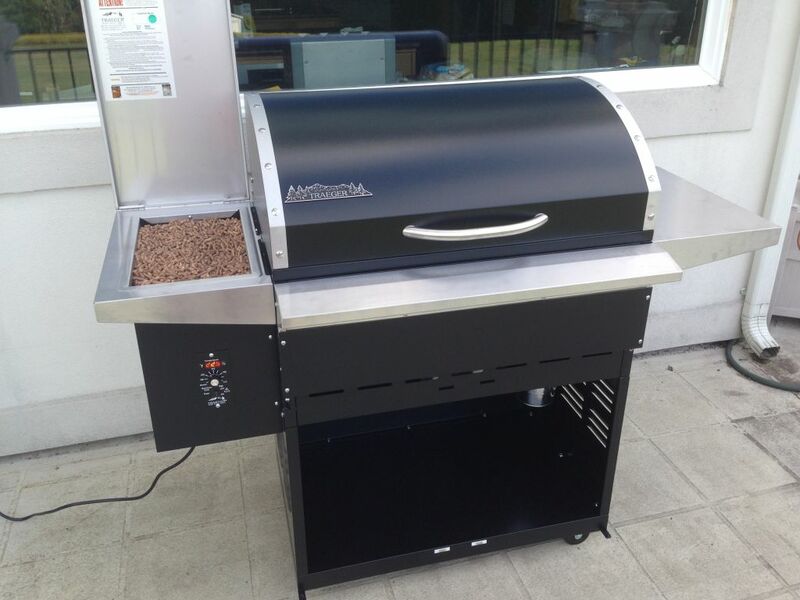 Should You Buy a Traeger Pellet Smoker? Smoking Meat Geeks | #MeatGeeks Copyright © 2019.